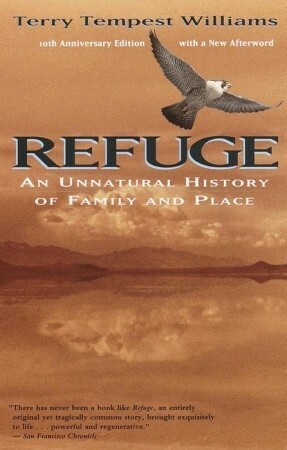 In Refuge: An Unnatural History of Family and Place, Terry Tempest Williams tells two overlapping stories that enrich and inform each other. One describes the environmental havoc wreaked in and around the Great Salt Lake, particularly as it affected the bird populations, as water levels reached abnormal highs in the 1980s. The other chronicles her mother's struggle with cancer and the family's struggle coming to terms with their matriarch's illness and eventual death. In her words, "an individual doesn't get cancer, a family does." was raised to believe in a spirit world, that life exists before the earth and will continue to exist afterward, that each human being, bird, and bulrush, along with all other life forms had a spirit life before it came to dwell physically on the earth...And if the natural world was assigned spiritual values, then those days spent in wildness were sacred. We learned at an early age that God can be found wherever you are, especially outside. This love of nature and the outdoors becomes a strong connection between women of different generations. Terry, her mother, and her grandmother watch and identify hundreds of birds around the Great Salt Lake, observing their behaviors and patterns, missing them when the environmental and man-made changes chase them away, rejoicing when they return. She also draws Mormon history in to her story, as it is so much a part of her. "Genealogy is in our blood. As a people and as a family, we have a sense of history." The Brigham City Cooperative, an ultimately unsuccessful attempt to live the United Order in the late 1800s, becomes a lesson in the importance of creativity, diversity and interdependence. "History has shown us that exclusivity in the name of empire building eventually fails. Fear of discord undermines creativity. And creativity lies at the heart of adaptive evolution." A recurring theme is authority and the tension between obedience and personal revelation. And she links this to our tendency as a people to be immobilized by change rather than accommodating, much less welcoming, it. Mimi questioned her, "Why is it then, Diane, that we are so willing to give up our own authority?" "It's easier," I interjected. "We don't have to think. The responsibility belongs to someone else. Why are we so afraid of being selfish? And why do we distract and excuse ourselves from our own creativity?" "Same reason," Mother replied. "It's easier. We haven't figured out that time for ourselves is ultimately time for our families. You can't be constantly giving without depleting the source. Somehow, somewhere, we must replenish ourselves." He asked him, if called, would he serve as stake president? My father's reply was no. In a religion that believes all leadership positions are decided by God, this was an unorthodox response. "Brother Tempest, would you like to explain?" My father simply said it would be inappropriate to spend time away from his wife when she had so little time left. President Monson stood and said, "You are a man whose priorities are intact." Faith and humility are intertwined in this memoir as well. "Faith is the centerpiece of a connected life. It allows us to live by the grace of invisible strands. It is a belief in a wisdom superior to our own. Faith becomes a teacher in the absence of fact." Humility buoys faith, and faith requires humility: "We're never going to figure it all out, so we might as well acknowledge the intangibles." Toward the end of the book Terry outlines the atomic testing that was done in Utah and Nevada during the 1950s. The government assuaged public fears and published their findings that there is "no basis for concluding that harm to any individual has resulted from radioactive fallout" despite the alarming rates of cancer in the surrounding population, cancer that took her mother, both grandmothers, and several aunts, and countless others. The government was declared immune to lawsuits, leaving the victims with no recourse. Terry finds parallels between the government's actions and her relationship with the Church and its culture. In Mormon culture, authority is respected, obedience is revered, and independent thinking is not. I was taught as a young girl not to 'make waves' or 'rock the boat. '...For many years, I have done just that--listened, observed, and quietly formed my own opinions, in a culture that rarely asks questions because it has all the answers. But one by one, I have watched the women in my family die common, heroic deaths...The price of obedience has become too high. The fear and inability to question authority that ultimately killed rural communities in Utah during atmospheric testing of atomic weapons is the same fear I saw in my mother's body. The death she sees around her becomes the impetus for her to speak up. Her sincerity, her integrity, her drive to ask questions and be unapologetically open and honest may have a high price, but it is one she is ultimately willing to pay because the alternative is worse: "What I do know, however, is that as a Mormon woman of the fifth generation of Latter-day Saints, I must question everything, even if it means losing my faith, even if it means becoming a member of a border tribe among my own people. Tolerating blind obedience in the name of patriotism or religion ultimately takes our lives."